Amazon Great Indian sale is currently live for Prime Members. The sale is offering deals on refrigerators from brands like Whirlpool, Samsung, Haier and more. Amazon’s Great Indian Festival Sale has already begun for Prime members. The e-commerce giant has some great deals and discounts on a wide range of gadgets across almost all major product categories. The sale will open to all customers from October 10, 2018. In this lister, we bring you the best deals Amazon has on refrigerators. So, here's a look at the top trending deals on Amazon, which are exclusively available to Prime members only. The Samsung 324L 3 Star Frost Free Double Door refrigerator comes with a Cool Pack feature that keeps your food frozen for up to 12 hours during power cuts. The refrigerator has a built-in fiber deodorizer filter, which eliminates the unpleasant smell from the fridge. The refrigerator is available on the Amazon Great Indian Festival Sale with a 26% discount. Click here to buy. The Whirlpool 265L 4 Star Frost Free Double Door refrigerator comes with an Air Tower and vent that lets out cool and fresh air that's spread into different sections of the refrigerator. The fridge is stabilizer free, which means you do not need to attach a separate stabilizer to the fridge. The refrigerator is available on Amazon today at Rs 22,999 along with an extra 10% cashback when buyers purchase it using an SBI debit & credit card. Click here to buy. The Haier HRF 618 Frost Free Side-by-Side Refrigerator features a Super Cooling function, which accelerates the cooling of the refrigerator easily in no time. It comes with a one-touch control LED panel as well that lets you set the temperature of the fridge conveniently. Click here to buy. The LG 687L Frost Free Side-by-Side Refrigerator comes with a Hygiene Fresh+ technology that claims to eliminate up to 99.999% bacteria from the fridge and removes bad odor as well. Users can also control the fridge via LG Smart ThinQ app from anywhere. The product is available on Amazon Great Indian Festival sale with a Rs 20,000 discount today. Click here to buy. 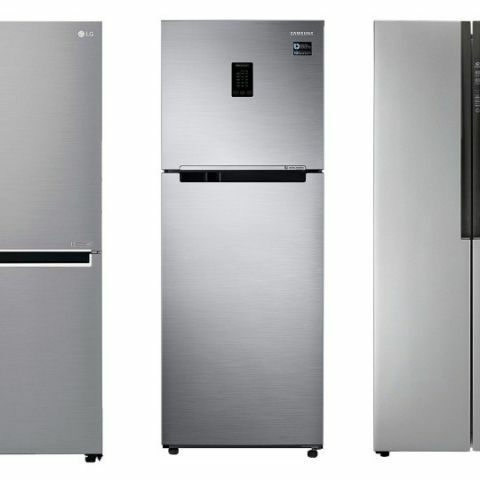 The Samsung 253L 2 Star Frost Free Double Door Refrigerator is up for sale on Amazon. The Samsung 253L fridge is convertible, which allows you to turn your fridge into a freezer. It comes with a Dual Fan technology that allows independent temperature control of the fridge and freezer. The product is available at a discounted price of Rs 21,899 for Prime members today. Click here to buy.